observed. 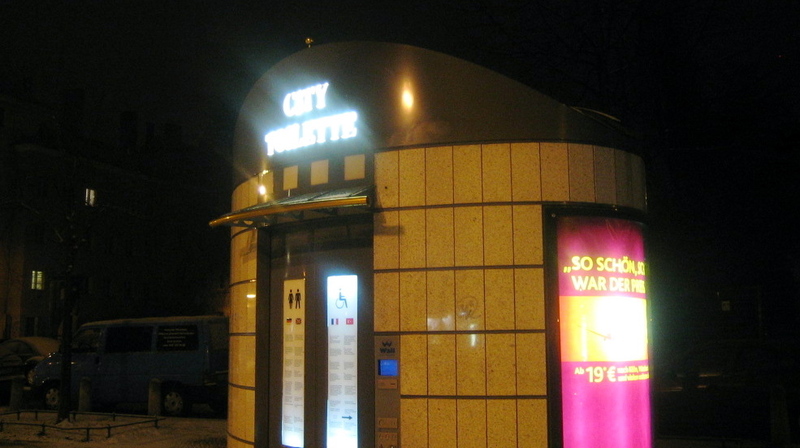 the jonberrydesign blog: notable: nice public toilets! Something I found on the streets of Berlin that falls in the 'why don't we have those' category: a public toilet booth. Okay, so I was desperate enough to give it a try, but boy was I surprised. You have to pay 50 cents, and when you do, suddenly the doors open up like in Star Trek. The booth is a single room, the lights come on, the doors close behind you - and my favorite part - the ambient trance disco music starts playing. I'm not kidding. The restroom is sparkling clean. Items are fully stocked. The sink has 3 parts to it all with motion sensors, one dispenses soap, the next water, and the next hot air to dry your hands. According to the signs, you get 20 minutes to take care of business before a warning signal sounds. As amazed as I was with the whole contraption, I didn't stand there long enough to find out.